Many homeowners today consider carpet inferior to hardwood floors. People prefer hardwood flooring over carpet for many reasons: carpet stains easily, has to be replaced every few years, and holds dirt and allergens, making it a bad choice for people with allergies. Hardwood floors, however, are full of benefits: they’re easier to clean, allergy friendly, and are so durable they last for decades. Installing hardwood floors in your home can increase its value, and it’s the smartest way to improve your home without spending significantly. Both hardwood floors and laminate flooring are great alternatives to carpet. But the two are different. Laminate flooring gives the appearance of hardwood floors, but costs less to purchase and install. Laminate flooring is made by pressing together compressed wood at high temperatures. The surface is then placed on top of the composite wood to give it the appearance of hardwood flooring. For the most part, laminate flooring resists wear and tear and scratches. However, lower-quality laminate flooring may have wood grain imprints that look artificial. Hardwood floors are harvested from trees, and the price of the flooring depends on how exotic the tree species from which it originates is. Hardwood floors are beautiful and can add a significant amount to the value of your home. However, without care, certain types of hardwood can get scratched and become worn in areas with heavy traffic. Whether you choose hardwood floors or laminate flooring for your home, they both can give your home a greater aesthetic appeal while also helping to improve your home. The cost of hardwood floors will depend on the type of wood you choose. According to Home Advisor, soft woods like pine ranges from $3 to $6 per square foot and an additional $3 to $5 per square foot for installation. Mid-range woods, such as oak and cherry, cost more. You can expect to pay from $5 to $10 per square foot for the materials and another $8 to $10 per square foot for the installation. The costliest types of hardwood floors to install in your home are floors made out of exotic wood such as mahogany, Brazilian walnut, cypress, or tigerwood. You can expect to pay from $8 to $14 per square foot for the boards and another $4 to $8 for installation. 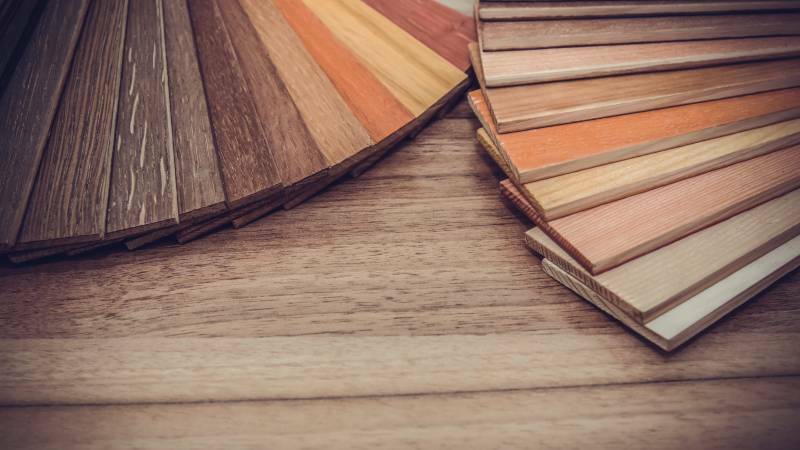 Since both wood and installation prices fluctuate depending on the area and your home, it’s best to do your own research to find out how much it would cost to purchase and install hardwood floors in your home. Laminate flooring is also available in several price ranges. Home Advisor reports that the least expensive laminate flooring ranges from $3 to $5 per square foot, while the installation costs can be expected at an additional $3 to $10 per square foot. Mid-range laminate flooring has a thicker veneer over a core comprised of five layers. For this higher quality flooring, you can expect to pay from $5 to $10 per square foot with an additional cost of $3 to $10 per square foot for installation. The highest-end laminate floors are made of seven layers with thick veneers. For these floors, you should expect to pay between $8 and $13 per square foot for the materials and an additional $3 to $10 per square foot for the installation. To learn more about how much it would cost to install laminate floors in your home, you’ll want to research local installers in your area to find out how much they charge. Choosing to install hardwood or laminate flooring in your home instead of carpet offers you countless benefits. Your home will be more aesthetically pleasing, and you’ll have floors that are more durable and able to last for years. You may also find hardwood and laminate floors are easier to keep clean than carpeted floors. To find an inexpensive installer near you, you should do your own research by searching for local hardwood and laminate flooring installers in your area and requesting quotes. An online search will allow you to see different experienced installers and hardwood or flooring professionals’ backgrounds, collect quotes and estimates, and determine the total cost before you make a decision. If you’re interested in installing affordable hardwood flooring, start a search today.